JEL classification: E43, G15, G18, G21, G23. Interest rate derivatives markets have undergone significant structural shifts over the last three years. Between April 2013 and April 2016, while average daily turnover increased moderately, the currency composition of activity saw the most pronounced change since the inception of the BIS Triennial Central Bank Survey in 1995 (Graph 1). Turnover measured in notional amounts nearly doubled for US dollar-denominated interest rate derivatives, while it halved for euro-denominated contracts. The relative sizes of over-the-counter (OTC) and exchange-traded derivatives markets also changed. Turnover in exchange-traded markets remained higher than in OTC markets, but OTC markets continued to grow faster. Average daily turnover in OTC markets increased by 16% over the last three years, to $2.7 trillion in April 2016. Most OTC interest rate derivatives activity consisted of swaps and forward rate agreements (FRAs). In exchange-traded markets, where futures and options are the most actively traded instruments, turnover increased at a slower rate, by 7.8% to $5.1 trillion. As a result, the share of exchange-traded interest rate derivatives in total turnover has fallen slightly, from 67% to 65.5% (Graph 1, left-hand panel). What are the drivers behind these developments? 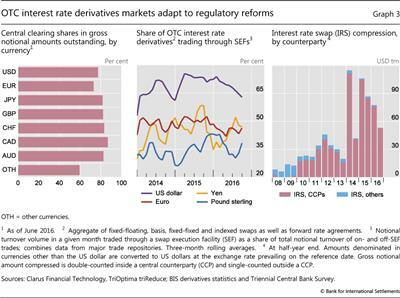 For one thing, interest rate derivatives markets have been adapting to a number of regulatory changes, as part of the broader financial reform agenda adopted by the G20 countries. The reforms aim at increasing transparency and limiting financial stability risks in OTC derivatives markets. Several elements of this agenda have been put into practice over the last three years, such as the move to central clearing, and to exchange-based or electronic trading of standardised OTC derivatives. Monetary policy has also played an important role, particularly with respect to differences in market trends across currency segments. Using more granular data from the Depository Trust & Clearing Corporation (DTCC), we show that most of the increase in the outstanding amount of US dollar-denominated contracts was due to trading activity in short-term instruments, while the outstanding amount of euro-denominated contracts declined for all maturities. 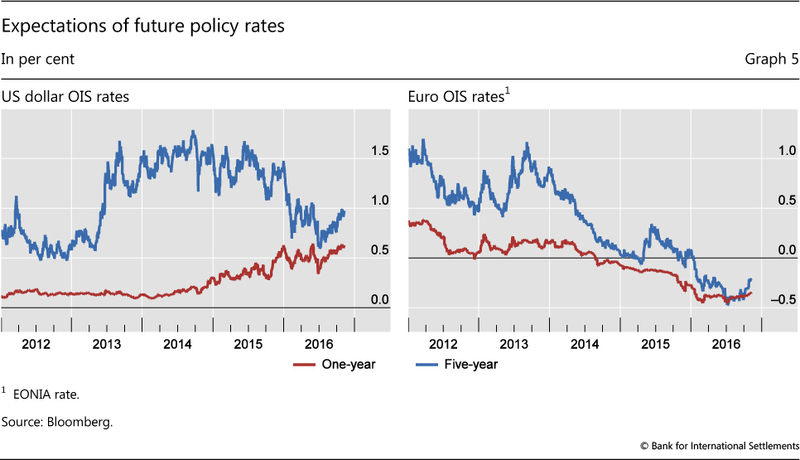 We argue that this reflected the divergent stance of monetary policies, given a heightened probability of policy rate increases in the United States and no anticipated change in the euro area. For longer-maturity contracts, however, activity in the US dollar segment was essentially flat. We suggest that reduced hedging activity by government-sponsored enterprises (GSEs) was a key factor, as the Federal Reserve took over a large part of their mortgage portfolios. The rest of the article is structured as follows. The first section analyses the Triennial Survey data on turnover by currency, instrument, location and counterparty. The second provides a comprehensive estimate of the share of centrally cleared OTC interest rate derivatives contracts outstanding and discusses a number of regulatory developments. The third focuses on the possible drivers of turnover in OTC markets, in particular the changing maturity composition of swaps and the link with monetary policy. The fourth provides an explanation for the lacklustre activity seen in long-maturity US dollar-denominated swaps. The final section concludes. The increase in turnover was entirely driven by swaps (Graph 2, left-hand panel). At $1.9 trillion, the turnover of swaps amounted to around 69% of the total market turnover of OTC interest rate derivatives in April 2016. All other instruments, including FRAs and options, saw declines in turnover over the last three years. 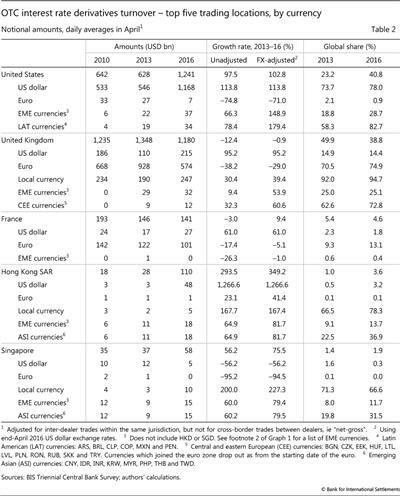 Derivatives contracts denominated in euros used to be the most actively traded by some margin, but they were supplanted in April 2016 by US dollar-denominated contracts. 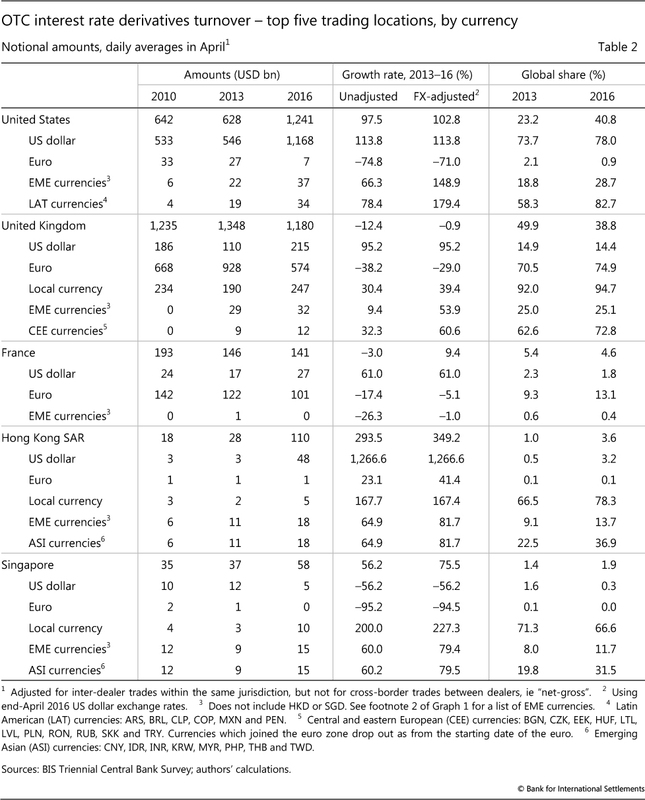 Turnover of US dollar OTC interest rate derivatives more than doubled to $1.4 trillion per day between April 2013 and April 2016, accounting for 51% of global turnover (Table 1, final column). This increase was driven by interest rate derivatives with short maturities (see below). At the same time, the turnover of euro-denominated instruments almost halved, to $641 billion. Even after adjusting for the impact of the euro's depreciation against the dollar, the fall was substantial (-35%). 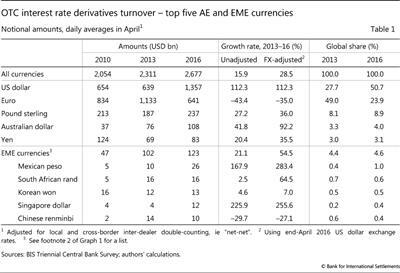 While global activity in OTC interest rate derivatives markets continued to be dominated by US dollar- and euro-denominated contracts, turnover in instruments denominated in emerging market economy (EME) currencies continued to grow (Table 1, bottom half). The growth was particularly evident once exchange rate changes were taken into account. In April 2016, the notional turnover of such contracts represented 4.6% of the global market, up from 4.4% in April 2013. However, trends in activity were uneven across currencies. The strong growth in Mexican peso-denominated contracts made that segment the top-traded EME currency segment for OTC interest rate derivatives, taking this spot from the Brazilian real. The notional turnover of interest rate contracts denominated in Chinese renminbi fell, in contrast to the increase in renminbi FX trading (Upper and Valli (2016)). Average daily turnover also declined for OTC interest rate derivatives contracts denominated in Brazilian reais and Indian rupees, but rose for others, such as the Hungarian forint, the Chilean peso and the Colombian peso (BIS (2016b)). 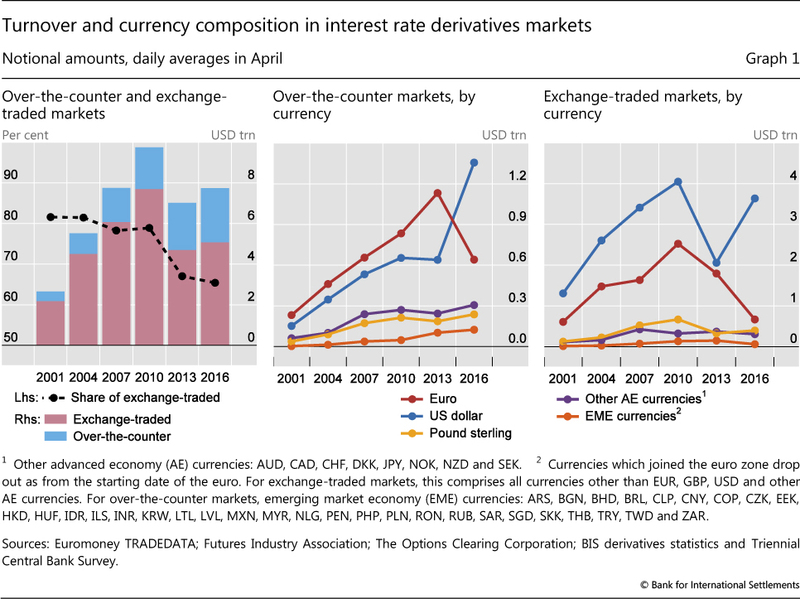 Changes in the currency composition of derivatives activity led to shifts in the relative importance of trading locations (Table 2). Traditionally, the United Kingdom had been the top global trading hub, but turnover there dropped by 12% between surveys, to $1.2 trillion per day in April 2016. As a result, the share of the United Kingdom in global turnover declined from 50% to 39%. This largely reflected the fall in euro-denominated OTC interest rate derivatives business, since the United Kingdom is a major trading hub for the euro segment, accounting for 75% of global trades. Offshore trading of US dollar-denominated contracts is much less prominent (Graph 2, centre panel). As a result, the rise in US dollar-denominated turnover went hand in hand with increased activity in the United States, which became the largest global trading hub for OTC interest rate derivatives. The G20 OTC derivatives market reform agenda has reshaped the structure of these markets in a number of ways in recent years. Even though the speed of implementation of the reforms has varied across jurisdictions, the impact on global OTC markets is already evident. Electronic trading has also become more prevalent. Since the mandatory execution requirements for swap trades came into effect in October 2013 as part of the Dodd-Frank Act, swap execution facilities (SEFs) have served to move a large share of OTC swap trading to electronic platforms (Graph 3, centre panel). Another key element of the G20 reform agenda has been the introduction of initial and variation margins for non-centrally cleared contracts. This has recently come into effect in the United States, Japan and Canada, and will be implemented in Europe and Asia in 2017 (FSB (2016)). Such margining requirements could raise the costs of OTC trading and thereby encourage a shift in trading activity to exchanges. OTC markets have adapted to regulatory changes by a wider adoption of portfolio compression (Graph 3, right-hand panel). Such compression reduces capital charges and trading costs by shrinking notional amounts outstanding, while leaving net exposures unchanged.9 The increasing use of clearing houses has facilitated trade compression, as they allow for an efficient identification of offsetting exposures. 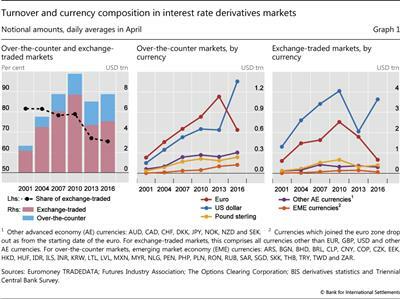 Activity in US dollar-denominated OTC interest rate derivatives contracts overtook activity in euro-denominated instruments between April 2013 and April 2016. What are the drivers of this major shift? We expand our analysis by using OTC interest rate derivatives data compiled by the DTCC. The DTCC captures a large share of the market (Abad et al (2016)) and provides data on gross notional amounts outstanding by currency. It also provides more detailed information than the Triennial Survey on instrument types and maturity breakdowns, and offers data at a weekly frequency. Our expanded analysis points to additional key facts. First, increased activity in overnight index swaps (OIS) was the main contributor to increased trading in US dollar-denominated instruments (Graph 4, left-hand panel). As OIS instruments typically have short maturities,10 an increase in outstanding amounts translates into a pronounced increase in turnover and can explain the rise in US dollar-denominated contracts in the Triennial Survey between April 2013 and April 2016. In the euro-denominated market segment, the decline in turnover was due to a decline in both OIS and interest rate swaps (Graph 4, centre panel). Second, in the US dollar market segment, gross notional amounts outstanding increased for shorter maturities. However, they actually declined for maturities of five to nine years, while longer maturities showed only limited increases. As a result, the share of notional amounts with maturities of five years and above declined (Graph 4, right-hand panel). In the euro-denominated market, by contrast, notional amounts outstanding fell across all maturities, with the largest decline occurring in instruments with short maturities (Graph 4, right-hand panel). Diverging monetary policies were an important determinant of the contrasting developments seen in the US dollar- and euro-denominated OTC interest rate derivatives markets.11 The fact that the increase in activity in US dollar-denominated contracts stemmed mostly from the OIS market, which is linked to policy rates, pointed to increased hedging and speculative demand in anticipation of rate rises. 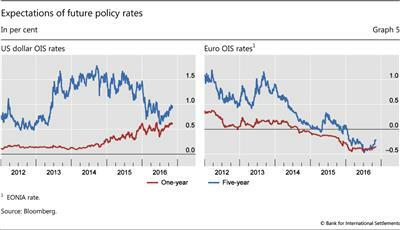 In contrast, the decline in the notional amounts outstanding of both short- and long-maturity contracts in the euro-denominated market suggests that in April 2016 market participants did not expect rate changes for several years. These expectations were reflected in OIS rates (Graph 5, right-hand panel). The impact of monetary policy is corroborated by the timing of the reactions observed in derivatives markets. In the United States, the gross notional amounts outstanding of swaps increased around the mid-2013 "taper tantrum". At the same time, rates for OIS with longer maturities increased, while the rates for OIS with shorter maturities remained virtually unchanged (Graph 5, left-hand panel). This suggests that market participants expected rates to rise in the future, albeit not in the forthcoming year. Gross notional amounts outstanding for OIS and swaps increased sharply immediately following the end of bond purchases by the Federal Reserve in October 2014. This affected short-term expectations of rate rises but left long-term rate expectations virtually unchanged. The turmoil in global financial markets in 2016 (BIS (2016a)) brought about a downward revision of expectations for longer-term rates (Graph 5, left-hand panel), as well as a decline in OIS outstanding amounts (Graph 4, left-hand panel). Gross notional amounts outstanding of euro-denominated contracts also experienced short-lived spikes around some of the monetary policy events in the United States, perhaps due to potential spillover effects. 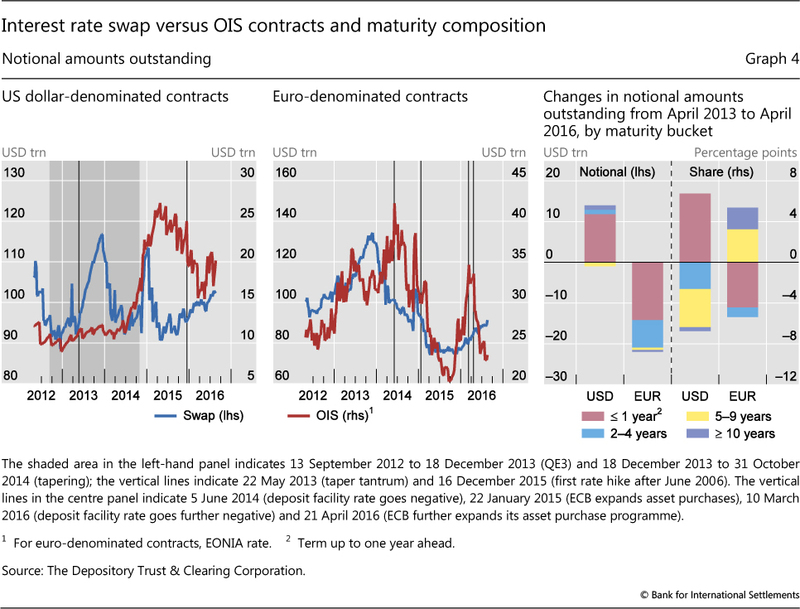 However, both OIS and interest rate swaps decreased overall - especially following the ECB's announcements of new asset purchase programmes (Graph 4, centre and right-hand panels). Negative interest rates in the euro zone may have been another factor dampening the demand for euro-denominated interest rate derivatives. Negative rates imply an additional cost of holding euro-denominated derivatives, as any cash deposited for margin requirements incurs a negative return. Indeed, the Triennial Survey data show that other currencies with negative short-term interest rates also saw declines in turnover. This was the case for the Swedish krona (-46% change, to $19.4 billion, from April 2013 to April 2016), the Swiss franc (-5.1%, to $14 billion) and the Danish krone (-57%, to $1.7 billion). Turnover in yen-denominated contracts, however, picked up by 20%, to $83 billion. But, this was still substantially below turnover volumes in earlier surveys. 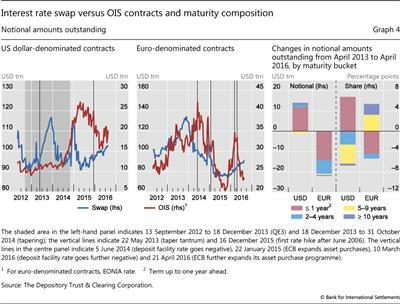 In contrast to the OIS market, activity in long-term US dollar swaps was not boosted by an expected tightening of US monetary policy (Graph 4, right-hand panel). We argue that the lack of activity in longer-term US dollar swaps reflects a structural shift in the hedging activities of GSEs. If anything, natural demand for receiving fixed rates should have increased with rising corporate bond issuance. Corporate hedgers were joined by pension funds and insurance companies in using the fixed rate payments of long-maturity swaps to match the typically shorter duration of their assets with the longer duration of their liabilities (Klinger and Sundaresan (2016)). On the other side of the market, GSEs are natural hedgers paying fixed rates. In this way, they can hedge their large portfolios of fixed income securities, particularly when short-term rates are expected to rise. 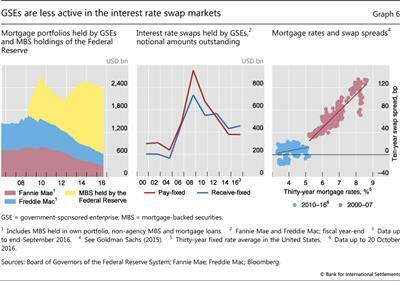 In the previous monetary tightening cycle of 2004-07, notional amounts of fixed-paying interest rate swaps in the portfolios of GSEs rose markedly (Graph 6, centre panel). Since quantitative easing started in the United States, however, the mortgage portfolios of the GSEs have fallen substantially, while that of the Federal Reserve has grown to around $1.5 trillion (Graph 6, left-hand panel). Furthermore, the notional amounts of swaps for which GSEs pay fixed rates have declined substantially (Graph 6, centre panel). As the Federal Reserve does not hedge its portfolio of mortgage securities, this change may also help explain why the link between mortgage rates and swap spreads has virtually disappeared (Graph 6, right-hand panel). 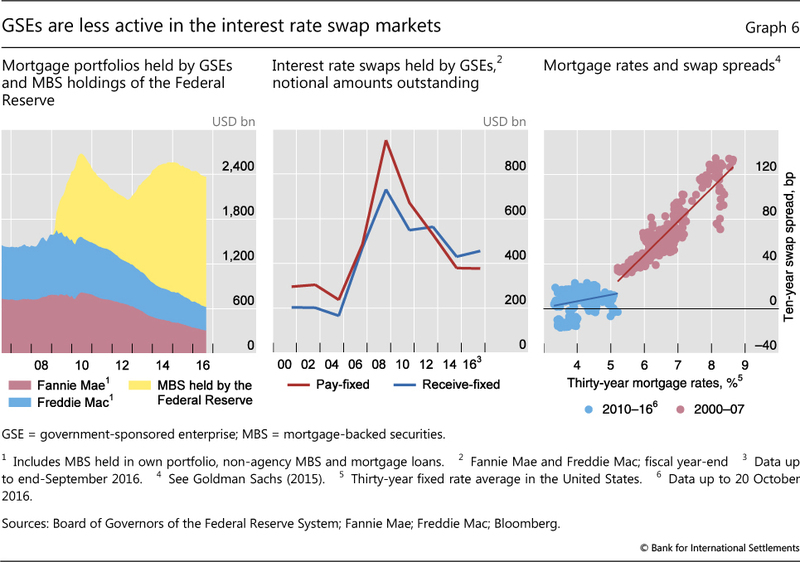 The key factors behind the subdued activity in longer-maturity swaps are likely to have included the absence of hedging activity by the Federal Reserve, the strongly reduced mortgage and swap portfolios of GSEs, and balance sheet constraints on swap dealers due to tightened regulation. In the absence of natural hedgers wishing to pay fixed rates, greater demand from corporate issuers, pension funds and insurance companies for receiving fixed rates, and reduced activity by swap dealers due to regulatory pressures, prices adjust downwards - to an equilibrium where other speculators are willing to take positions. Accordingly, swap spreads have fallen for longer maturities (Clark and Mann (2016)). 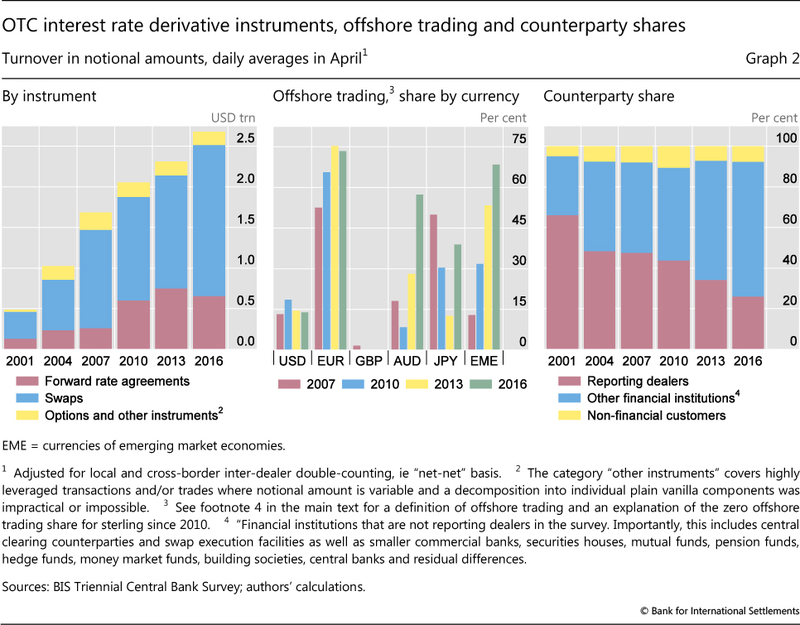 Amid low and stable interest rates across the globe, trading in OTC and exchange-traded interest rate derivatives markets has grown moderately. The structure of those markets, however, has changed shape, owing to a shift in the currency composition of contracts and to regulatory reforms. We argue that monetary policy has been an important driver of the shift in the currency composition of activity from the euro to the US dollar. In the euro-denominated market segment, the expected persistence of stable and negative interest rates has reduced demand for swaps, while the rise in the turnover of short-term swaps in the United States is consistent with expectations of increasing short-term rates. We also suggest that the reduced demand for swaps by the GSEs in the United States has been a key factor behind the subdued activity observed in long-term swaps. 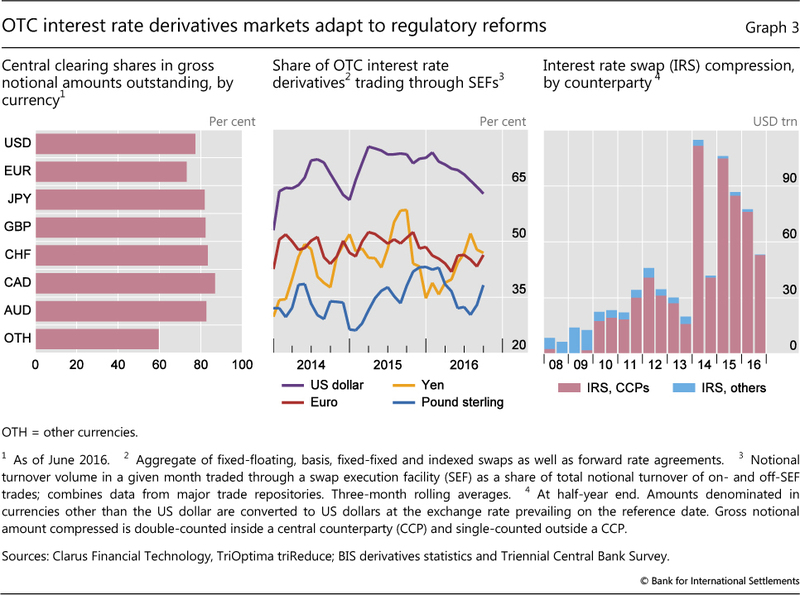 Several reforms on the G20 agenda have had an impact on the structure of OTC interest rate derivatives markets. More than 70% of notional values are now centrally cleared in all major currency segments, reducing counterparty credit risk. Electronic trading platforms, including swap execution facilities, have made inroads, improving market liquidity and transparency. OTC markets have adapted to regulatory changes by increasing their recourse to services, such as portfolio compression, that lower capital charges by reducing notional amounts, while keeping net exposures unchanged. The full impact of the recent introduction of margining requirements for non-centrally cleared contracts on OTC markets may lead to further structural changes. Abad, J, I Aldasoro, C Aymanns, M D'Errico, L Rousová, P Hoffmann, S Langfield, M Neychev and T Roukny (2016): "Shedding light on dark markets: first insights from the new EU-wide OTC derivatives dataset", European Systemic Risk Board Occasional Paper Series, no 11, September. Bank for International Settlements (2016a): "Uneasy calm gives way to turbulence", BIS Quarterly Review, March, pp 1-14. 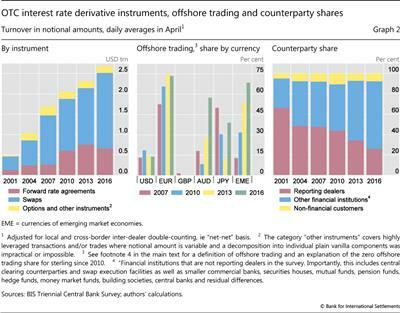 --- (2016b): "Triennial Central Bank Survey - OTC interest rate derivatives turnover in April 2016", September. --- (2016c): "Glossary", BIS Quarterly Review, December, pp 27-34. Clark, J and G Mann (2016): "Examining swap spreads and the implications for funding the government", Treasury Notes Blog, US Department of the Treasury, September. Committee on the Global Financial System (2014): "Market-making and proprietary trading: industry trends, drivers and policy implications", CGFS Papers, no 52, November. Financial Stability Board (2016): "OTC derivatives market reforms: eleventh progress report on implementation", August. Goldman Sachs (2015): "Why negative swap spreads might be here to stay", November. Klinger, S and S Sundaresan (2016): "An explanation of negative swap spreads: demand for duration from underfunded pension plans", mimeo. Kreicher, L and R McCauley (2016): "Asset managers, eurodollars and unconventional monetary policy", BIS Working Papers, no 578, August. Moore, M, A Schrimpf and V Sushko (2016): "Downsized FX markets: causes and implications", BIS Quarterly Review, December, pp 35-51. Upper, C and M Valli (2016): "Emerging derivatives markets? ", BIS Quarterly Review, December, pp 67-80. Wooldridge, P (2016): "Central clearing predominates OTC interest rate derivatives", BIS Quarterly Review, December, pp 22-4. 1 The views expressed in this article are those of the authors and do not necessarily reflect those of the BIS. We thank Claudio Borio, Ben Cohen, Frank Packer, Hyun Song Shin, Laurence White and Philip Wooldridge for their valuable comments as well as Charles Himmelberg, Tomasz Jakubcyk and Oliver Schmidt for insightful discussions. We are grateful to Jeff Slee for his excellent research assistance and Denis Pêtre and Tsvetana Spasova for guidance on the use of the Triennial Survey data. See the glossary (BIS (2016c)) for definitions of relevant technical terms. 2 Currency adjustments were made on the basis of average US dollar exchange rates in April 2016. 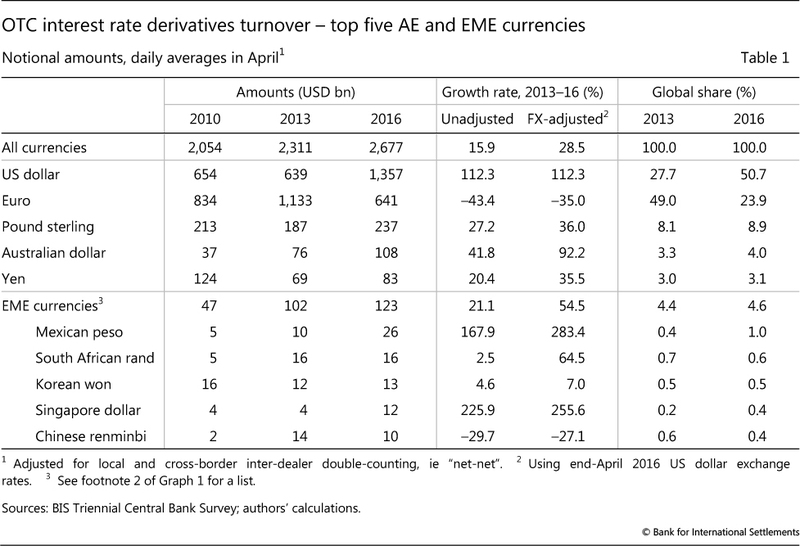 Since many currencies depreciated against the US dollar between April 2013 and April 2016, turnover amounts for April 2013 were adjusted downwards, resulting in higher overall growth of turnover. 3 Part of the reported increase is likely to have been due to more comprehensive reporting by dealers. The major change in the currency composition is, however, unlikely to have been affected in a significant way. Data are subject to change. 4 Offshore trading is defined as the global notional turnover of a given currency ("net-net", ie adjusted for both local and cross-border inter-dealer double-counting) minus all trades where at least one counterparty is residing in the respective currency area ("net-gross", ie adjusted for local inter-dealer double-counting). For instance, US dollar offshore trades would be defined as global trades of US dollar-denominated contracts minus turnover of US dollar-denominated contracts reported in the United States. This implies that the trades with cross-border counterparties reported in the respective currency area are excluded from offshore trades. In some cases, very low offshore trading volumes can be due to "over-netting", as cross-border inter-dealer double-counting is overestimated. 5 See Upper and Valli (2016) for a further discussion of the evolution of derivatives markets in EMEs. 6 Both electronic trading platforms (including swap execution facilities) and central clearing counterparties are captured under "other financial institutions" in the Triennial Survey. See also footnote 4 in Graph 2. 7 Turnover data are reported on a pre-novation basis, whereas outstanding data are reported on a post-novation basis. 8 See Wooldridge (2016) for further discussion of trends in central clearing of OTC interest rate derivatives. 9 See also Schrimpf (2015). 10 According to the DTCC data, as of 29 April 2016, OIS with a term ending in 2016 accounted for around 80% of US dollar-denominated contracts and 54% of euro-denominated contracts in terms of notional amounts outstanding. 11 See Kreicher and McCauley (2016) on the impact of monetary policy on exchange-traded interest rate derivatives, in particular eurodollar futures.